In November 2017, a case of sudden death in lambs grazing lucerne was investigated near Cowra in the Central Tablelands. The producer reported losing approximately 30-40 prime lambs over a one to two week period with no indication of illness prior to death. The lambs had been drenched with Q-drench (Abamectin 1.0 g/L, Albendazole 25.0 g/L, Closantel 37.5 g/L, Levamisole hydrochloride 40.0 g/L) 3 weeks prior and had received two injections of 6 in 1 (Clostridium perfringens (type D), Cl. Novyi, Cl. chauvoei, Cl. septicum, Cl. tetani, Corynebacterium pseudotuberculosis). Pasture comprised lucerne stand with some native grasses growing along the fence line. Initially when the deaths started the lambs were supplemented with lucerne hay which corresponded with a cessation of deaths. It was when the producer discontinued the hay that he again started seeing deaths. A post-mortem was conducted on one of the dead lambs. The carcase was markedly bloated and starting to autolyse but there were no other abnormal findings externally. There was approximately 500ml of serosanguinous fluid in the peritoneal cavity. From approximately 120cm distal to the pylorus to the lumbar flexure of the colon, the intestines were discoloured dark red to black and markedly gas filled becoming more dilated caudally (Fig 1). The rumen had a small amount of fresh lucerne and liquid present. The remaining abdominal contents appeared normal and the chest cavity was normal. A diagnosis of intestinal torsion/red gut was made based on the history and post-mortem findings. The producer was advised to supplement the lambs with roughage which he did in the form of lucerne hay. Following this supplementation the producer reported no more losses. Post-mortem findings include dark red discolouration of the small and large intestine beginning approximately 120cm distal to the pylorus and extending to the lumbar flexure of the colon. Histologically the mucosa shows marked capillary and venous congestion and extensive haemorrhage in the lamina propria. Grazing roughage decreases the incident of red gut by slowing the passage of digesta though the gastrointestinal tract, reducing hypermotility of the small intestines and gas distension of the large intestines. Roughage also increases the size of the reticulorumen which helps stabilize the intestines and prevent their displacement. (2) Roughage can be supplied in the form of ad lib hay or by intermittent grazing of highly digestible and fibrous pastures. 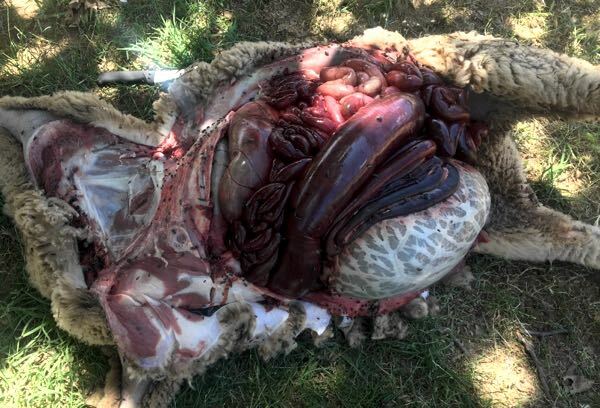 Red gut in sheep is reported to be a relatively rare condition in Australia, however I have had two confirmed cases of producers losing sheep to red gut in the last 12 months. All cases were in lambs grazing lucerne prior to sale. Considering the value of prime lambs, preventative action including supplementing roughage or alternate grazing of low risk pastures should be considered when grazing lush, highly digestible pastures.